I went to the new house for the first time since coming home from the hospital. It is really coming along. We will be living there by next week. I can't wait to just have one house and have my husband back too. He has been super busy over there! This is the entry. I still need to get a new light fixture. The gold is not working for me. The walls are pink and the ceiling is green. I am standing in what will be the dining room. 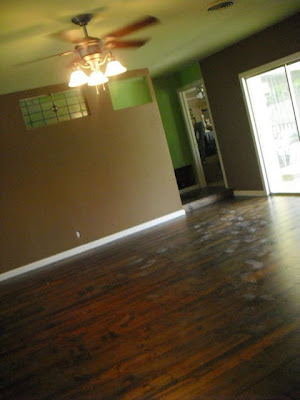 All the wood floors are done and the base boards and trim are in too. They were all getting painted today. This is the breakfast nook in the kitchen looking into the sitting room/office. I hung some things last week. I am so glad I did that, because now I am pretty useless. Today Marcus and my dad took out the appliances and counter tops. I think the new stuff is going in tomorrow. 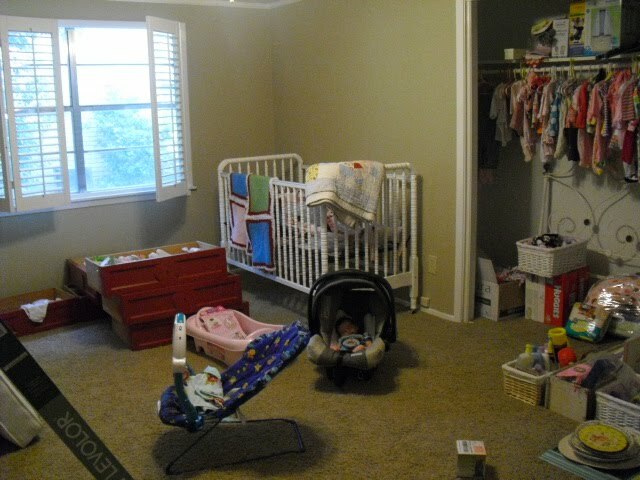 And lots of you keep asking to see the nursery. I can't wait to get this thing decorated. Katie didn't seem to mind though. Today was her first time to see her new house. Today we went to Target, but I didn't get a picture. 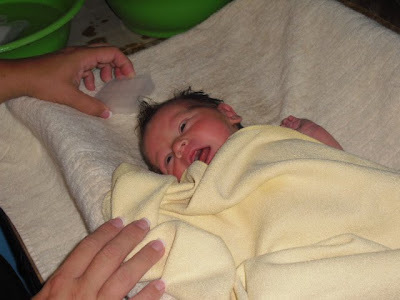 And this is her getting her first bath. We can't dunk her until her belly button thing-a-ma-jig comes off. 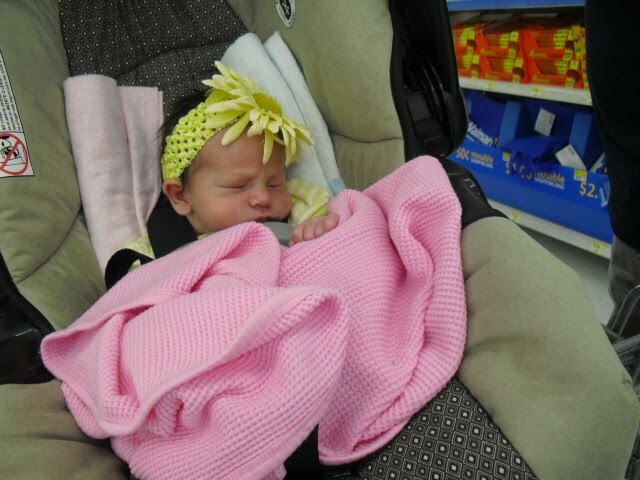 And this is Katie going to her first Sunday lunch at Aunt Lisa and Uncle David's house. She's had quite the active social life so far! Congratulations on your sweet baby girl! What a cutie!!!! And you new home is beautiful. You are so good at decorating!!!! Congrats on the baby and the house! Wow, you're one busy lady!!! she is sooo sweet. the house is coming along great. i know you are dying to get it done! enjoy the new house & baby!!! Um, didn't you JUST have a baby? You'd never guess by how busy you are. And a c-section, too! I was kind of the same way. Out at Target when she was 5 days old. People thought I was crazy. The house is looking awesome! I'll be looking for my housewarming invitation in the mail any day now. I'm commenting for the first time, been checking your blog off and on from Kelly's blog. Katie is absolutely adorable, congratulations! Reading your posts makes me exhausted, a new house and a new baby, oh my. 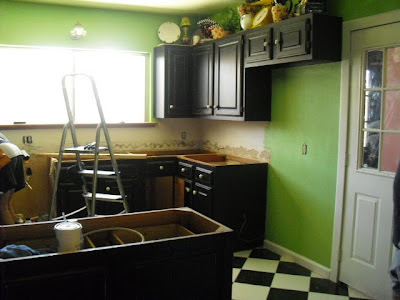 What really brought me out of my lurking comfort zone is your kitchen paint. What color did you use? I love it! 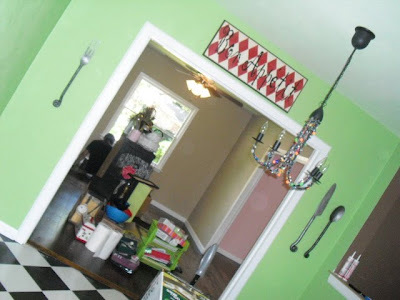 I'm trying to decided on a green and have several spots painted on my walls right now and can't find one that I love. I really like your painted cabinets and the so-cute knobs! what a beautiful baby girl! I know you all are feeling so blessed. 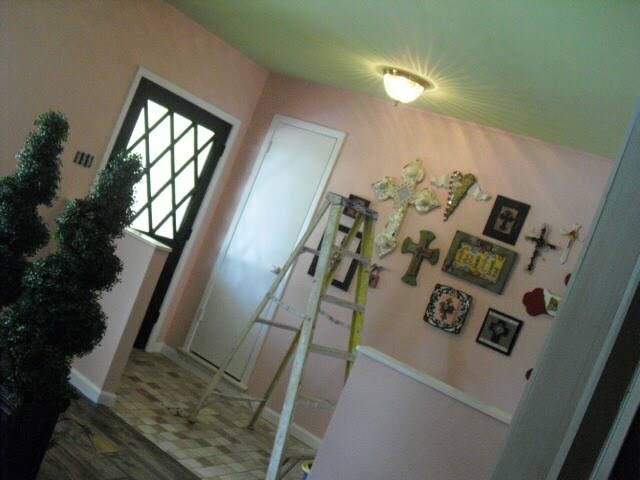 I just wanted to say that I love the crosses on the wall in the entry hall! Ps. Lauren slept in her pack-n-play in our room until she was about 7 months old! Her room was upstairs and ours was downstairs and she wasn't a good sleeper until that age! I couldn't go up and down all night long! :) So don't stress about the nursery, it looks like Katie is a happy girl! Congrats on your beautiful baby and house too! Well I haven't checked in a week and you had KATIE??????? Surprise! She is beautiful!!!!!! Congratulations! Katie is so beautiful!!! Glad that the house is coming along and you can get settled in soon! Katie is so cute!!! Girls are so fun to dress up. Love the bows. Your house is coming along wonderful. Can't wait to see it all finished and decorated. Sounds like you are recovering fast too. Amy told me you had your baby. I am so happy for you and Marcus! She is such a doll...absolutely adorable! 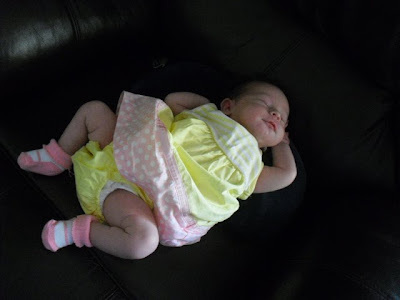 Katie is by far the cutest thing on your blog now :) She is perfect! I hope she is sleeping so you can sleep! I also wondered where you got the large flatware pieces in your kitchen? I am a flatware buyer for a department store and I would love to find them for my kitchen. Your little Katie is just precious!